In one of his Friday sermons in January, 75- year-old Grand Ayatollah Sayed Mohamed Hussein Fadlullah, who died Sunday in Beirut, spoke to his followers about “true Islam”. “The true Islam,” he said, “wants us to base our lives on reason and to elevate it by means of knowledge, so as to enrich it and be enriched by it.” This sentence summed up Fadlullah, or Al-Sayed as his followers called him, and the doctrine he embraced across a lifelong struggle for Islam. It was also this doctrine that earned Al-Sayed iconic status across the Muslim world for his great contribution to Islamic thought and jurisprudence, elevating him as one of the great Islamic thinkers of his time. On Tuesday, tens of thousands of mourners flocked to Beirut’s southern district to pay their last respects to a man that at times of bleak fitna (strife) emerged as a guiding light to millions of Muslims, regardless of their sectarian affiliation. At a time when very few Islamic figures were able to nurture a cross sectarian following, Fadlullah did. Although media outlets — both Western and non-Western — identify Fadlullah as a “Shia” scholar, this identification was one he did not subscribe to. His contribution to the renewal of Islamic thought and jurisprudence in general through his countless fatwas offering original insights was significant beyond his contributions to Shia faith. Born in 1935 in the city of Najaf to Lebanese parents, Fadlullah grew up in a family of scholars. 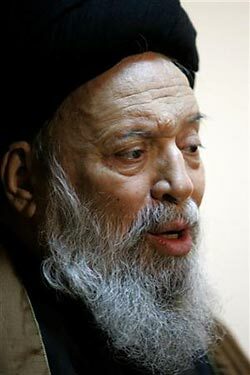 His father, Ayatollah Abdel-Raouf Fadlullah, migrated to Iraq to complete his religious education in Al-Hawza Al-Deeniya (the religious seminary). Fadlullah followed in his father’s footsteps and was the disciple of many celebrated Shia scholars, including Abul- Qassem Al-Khoei, Mohsen Al-Hakim and Mohamed Baqir Al-Sadr. Upon completing his religious education, Fadlullah displayed great talent in interpretation and inspired a growing following of students. In 1966, he went to Lebanon to establish the Institute of Islamic Jurisprudence. Fadlullah’s Friday sermons were not just about religious teachings alone. What perhaps singled him out among his peers was that he never separated politics from religion. While the first parts of his sermons would tackle religious issues, Fadlullah was keen to address current affairs in subsequent parts. At the heart of his body of teaching, three key issues rose to dominance: the struggle for Palestine, fighting for Islamic unity, and resisting US hegemony and Arab despotism. Hardly a sermon went by without reference to these topics and Fadlullah always displayed an impressive knowledge of current affairs. He reserved the harshest words for Arab officialdom, the US and Israel. Indeed, his scathing criticism of US policies in the region and Israel’s occupation of Arab land made him a target of numerous assassination attempts on his life. The most dangerous was during the 1980s when an explosion targeted his headquarters in Al-Imam Al-Reda Mosque in Bir Al-Abad area. Fingers pointed to both the US and Saudi Arabia. Over the years Fadlullah grew to become one of the most prominent scholars of Islamic thought and an inspiration for the nascent Islamic movement in Lebanon. When the Islamic Resistance Movement (Hizbullah) came into existence in 1982, Fadlullah became its spiritual leader. Along the years, the relationship grew complicated. The year 1994 represented a watershed. Fadlullah declared himself a marjie taqlid (a source of emulation) and addressed the issue of wilayat al-faqih (the guardianship of the clerics), which he did not accept. He maintained a distance from both Hizbullah and the Islamic Republic of Iran, presenting himself as an independent scholar and jurist. Despite being subject to smear campaigns from time to time, Fadlullah remained committed to the cause of resistance. Until his last days, Fadlullah defended both Iran and Hizbullah against campaigns that targeted them. A notable number of Hizbullah followers continue to consider Fadlullah as their source of emulation. Hizbullah Secretary-General Hassan Nasrallah once described the relationship with Fadlullah by saying “both Hizbullah and Sayed Fadlullah have a unity of purpose and of vision.” Following Fadlullah’s death, Nasrallah issued a statement referring to himself and other resistance leaders as “among Fadlullah’s disciples”. The statement was viewed as a move to put an end to speculation surrounding the complicated relationship. After the 2006 Israeli war on Lebanon, Fadlullah was among the few voices that continued to lend support to the resistance, both in his sermons and interviews. Among the legacies Fadlullah is leaving behind is an extensive network of social institutions. This includes nine orphanages, 18 schools, and a large number of religious and cultural centres in Lebanon, Syria and Iraq. Two statesmen met in Washington on Tuesday who are looking smaller and smaller, who are taking smaller and smaller steps. They have decided not to decide, which in itself is a decision. When the chance of a two-state solution has long since entered injury time, they have decided on more extra time. Get ready for the binational state, or the next round of bloodletting. My question is, which nations are they referring to? Israel and Palestine or Israel and the USA?? Two statesmen met in Washington on Tuesday who are looking smaller and smaller, who are taking smaller and smaller steps. It really was an excellent meeting: The chance that a binational state will be established has improved as a result; relations between Israel and the United States are indeed “marvelous.” Israel can continue with the whims of its occupation. The president of the United States proved Tuesday that perhaps there has been change, but not as far as we are concerned. The masked ball is at its peak: Preening each other, Obama and Netanyahu have proved that even their heavy layer of makeup can no longer hide the wrinkles. The worn-out, wizened old face of the longest “peace process” in history has been awarded another surprising and incomprehensible extention. It’s on its way nowhere. The “warm” and “sympathetic” reception, albeit a little forced, including the presidential dog, Bo, the meeting of the wives, with the U.S. president accompanying the Israeli prime minister to the car in an “unprecedented” way, as the press enthused, cannot obscure reality. 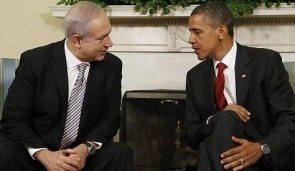 The reality is that Israel has again managed to fool not only America, but even its most promising president in years. It was enough to listen to the joint press conference to understand, or better yet, not understand, where we are headed. Will the freeze continue? Obama and Netanyahu squirmed, formulated and obfuscated, and no clear answer was forthcoming. If there was a time when people marveled at Henry Kissinger’s “constructive ambiguity,” now we have destructive ambiguity. Even when it came to the minimum move of a construction freeze, without which there is no proof of serious intent on Israel’s part, the two leaders threw up a smoke screen. A cowardly yes-and-no by both. More than anything, the meeting proved that the criminal waste of time will go on. A year and a half has passed since the two took office, and almost nothing has changed except lip service to the freeze. A few lifted roadblocks here, a little less blockade of Gaza there – all relatively marginal matters, a bogus substitute for a bold jump over the abyss, without which nothing will move. When direct talks become a goal, without anyone having a clue what Israel’s position is – a strange negotiation in which everyone knows what the Palestinians want and no one knows for sure what Israel wants – the wheel not only does not go forward, it goes backward. There are plenty of excuses and explanations: Obama has the congressional elections ahead of him, so he mustn’t make Netanyahu angry. After that, the footfalls of the presidential elections can be heard, and then he certainly must not anger the Jews. Foreign Minister Avigdor Lieberman is pressuring Netanyahu now; tomorrow it might be Likud MK Danny Danon, and after all, you can’t expect Netanyahu to commit political suicide. And there you have it, his term in office is over, with no achievements. Good for you, Obama; bravo Netanyahu. You managed to make a mockery of each other, and together, of us all. Netanyahu will be coming back to Israel over the weekend, adorned with false accomplishments. The settlers will mark a major achievement. Even if they don’t not admit it – they are never satisfied, after all – they can rejoice secretly. Their project will continue to prosper. If they have doubled their numbers since the Oslo Accords, now they can triple them. And then what? Here then is a question for Obama and Netanyahu: Where to? No playing for time can blur the question. Where are they headed? What will improve in another year? What will be more promising in another two years? The Syrian president is knocking at the door begging for peace with Israel, and the two leaders are ignoring him. Will he still be knocking in two years? The Arab League’s initiative is still valid; terror has almost ceased. What will the situation be after they have finished compromising over the freeze in construction of balconies and ritual baths?